Casement style window awnings that are designed in the classic style of casement awnings designed to accommodate casement windows with the need for their greater projection. One of the unique features about the casement series of window awnings is the fact they can be made with a different style of valance if so desired as well as a straight edge valance for a more contemporary look. These beautiful window awnings can be sized from three feet wide all the way out to 20 feet wide in a combination of three different projections. The Sunbrella awning fabric is made to block up to 94% of the sun�s U.V. rays as well as reduce the solar heat buildup caused by direct sunlight thereby reducing your overall cooling bills plus the fabric is backed up with a five year warranty. The awning frame is structured around a no rust anodized aluminum frame and galvanized staples are used to secure the fabric to the frame. Finally Gore-Tex weather resistant Tenera thread is used on all the fabric seams. In short this is a perfect awning for your casement windows and is designed for a lot more than one season of use. The casement window awnings come fully assembled and ready to mount on your windows saving you a little extra time and maybe even a little extra aggravation in having to assemble the frame and mount the fabric. 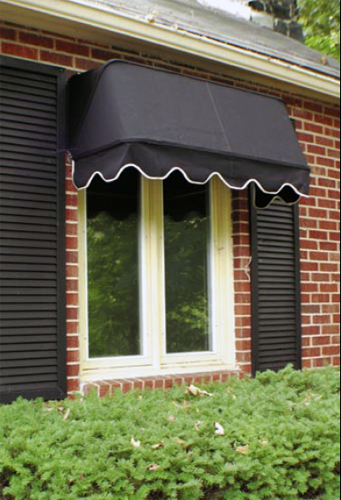 If you would like to customize these beautiful window awnings even further you can have 2� tall lettering placed upon the six inch valance for an additional price and you can also add a pull up kit as an option if the need to retract this awning if you live in an area with frequent high winds and inclement weather.